Tonight at sundown the Festival of Shavuot will begin. This being the last in the yearly cycle of Holy Days on the Hebrew calendar. Shavuot traditionally commemorates the giving of the Torah to the Hebrew nation at Mt. Sinai. Whatever happened to Number 6,8 and 10??? Where is it written that it is OK to murder? Where is it written that it is OK to steal (the lands not owned by you)?? 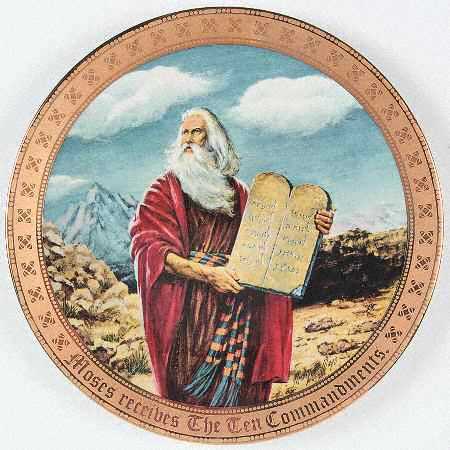 And Commandment Number 10 ??? The disturbing philosophy expressed in Torat Ha’Melech emerged from the fevered atmosphere of a settlement called Yitzhar located in the northern West Bank near the Palestinian city of Nablus. Shapira leads the settlement’s Od Yosef Chai yeshiva, holding sway over a small army of fanatics who are eager to lash out at the Palestinians tending to their crops and livestock in the valleys below them. One of Shapira’s followers, anAmerican immigrant named Jack Teitel, has confessed to murdering two innocent Palestinians and attempting to the kill the liberal Israeli historian Ze’ev Sternhell with a mail bomb. Teitel is suspected of many more murders, including an attack on a Tel Aviv gay community center. Thus on the eve of peace negotiations, Bibi chose political expediency over condemning the murderous oath of a coalition partner. A boy emerges from a known opening in the separation barrier in order to pick herbs, and is shot to death. Little girls return from school walking through a settlers’ orchard, and are detained for hours by Judea and Samaria District police after the owner of the estate complained that a few cherries were picked. A security guard at a border crossing kills a judge as a result of an angry exchange, and suddenly it turns out that the cameras weren’t working. When the cameras work from the Palestinian side, we questions quality of the film instead of asking how two boys were killed at a demonstration. Amos Oz got it wrong again. Bloodcurdling bureaucracy and the banality of evil, here in the land of milk and honey. Amos Oz got it wrong again. It’s not neo-Nazis. It’s Judeo-Nazis. Scions of a unique group which Yeshayahu Leibowitz Prophesized so well immediately after the great victory of 1967. Racism, murderousness and profound hatred originating in a religious-messianic worldview that is fueled by the occupation and settlement enterprise. Of course at this stage, they’re on the margins. But history has proven that the question is how the center responds to the margins. In the wake of the most recent outbreaks of Kristallnacht-inspired rioting, the settler right hastened to label the rioters disdainfully as “graffiti-scribbling youth.” In the buses, more and more stickers are cropping up in Hebrew and Arabic with the warning: “Don’t even dare think about a Jewish woman!” Posters and articles warn not only against “assimilation” but also against Arab employment and housing. Behind this perception there are people, arbiters of halakha or Jewish religious law, organizations, and political movements. Is anyone bothering to investigate, to arrest, to judge? Israel will never be the Germany of 1942, but there is a moral obligation to prevent it from becoming like the Germany of 1932. In the state of the Jewish people it’s already too late. There is no place where we can take the shame and the terror. The center is apathetic. The left is defeated and afraid, in despair, emigrating, fighting among itself, just as in Germany of the early 1930s. Meanwhile generations of Israelis, incited and consumed with hatred, are flooding the public space, and there is nobody to confront them. Salvation won’t come from the Tzavta theater. They don’t give a damn about Amos Oz. They’re on YouTube with David the Nahal soldier and on Facebook, where one Israeli, a retired Israel Defense Forces employee, suggested collecting Oz’s books and using them as fuel for the Lag Ba’omer bonfire. Only the accursed poetics works overtime. For example, when it turns out that a soldier from the well-oiled IDF “communications division” decided to join the firing at demonstrators for the fun of it. Or when an 85-year-old Holocaust survivor, one of the “living witnesses” that the government is so eager to have accompany trips to the extermination camps, slips and is seriously injured at the end of a visit to the Majdanek camp. The Education Ministry rejects all responsibility, responding to a lawsuit by saying she “freely chose to join the trip to Poland… and if the supposed accident really did take place, it happened due to the negligence of the plaintiff, who didn’t pay attention to where she was going.” Here you have it, bloodcurdling bureaucracy and the banality of evil, here in the land of milk and honey. Equally interesting: Compare the [total lack of] coverage of Torat Ha’Melech with what would happen if a Muslim, preferrably an Iranian or a Palestinean, published an interpretation of the Quran saying god meant true believers to kill non-Muslims.